We are so delighted to see you today! I hope you enjoy what we have to share. Today I am showing off a new cup to me. I do love a blue cup! Especially what I call Martha Stewart blues and greens. This cup is more of a robin egg blue, which goes so well with the scrolling gold designs and the gold handle. It is slightly waisted, and is a generous size for a great cup of tea. The flowers inside the cup are a sweet surprise, as the outside is less decorated. I found this cup when I went up north to visit my son and his family..and my new grandson. The handle is very fancy all decked out in gold. You can see the scroll and two other embellishments, a spur and thumb rest just barely there. The flowers inside the cup are very well done. Lovely vibrant colors of many different flowers. I find this scroll design interesting. Top view of a gorgeous cup! The plate has complementary flowers gracing the center. 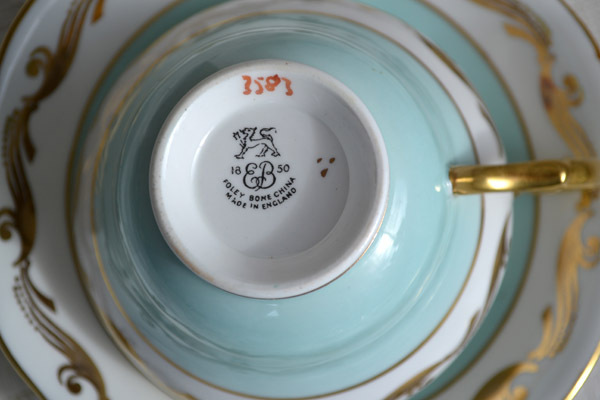 The backstamp tells us this cup was manufactured by E.B Foley. A very fine maker of china. I have a few Foley cups, and they are all very high quality and beautiful. The reddish orange numbers were added later, 3583? And I am guessing it is the pattern number. There are also three gold dots. I think they may tell who the artist is. From my research I have found this cup was created somewhere between the 1940-1950. 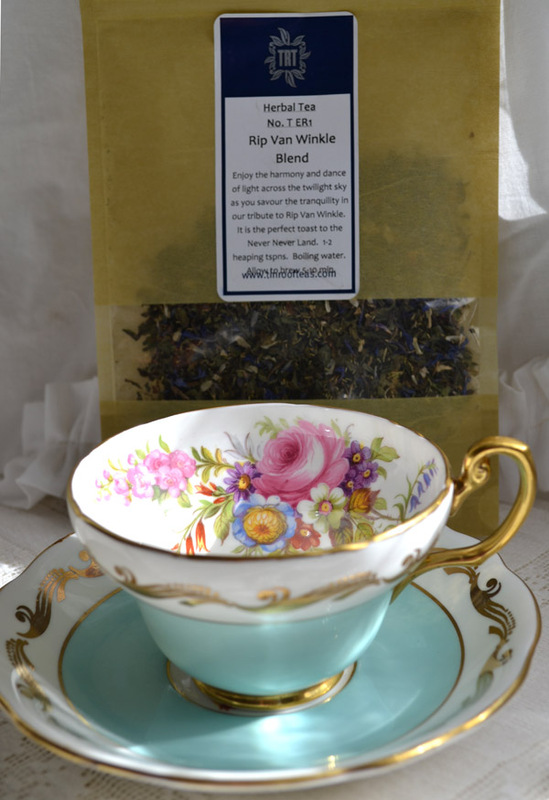 I also wanted to share with you a new tea I have found called Rip Van Winkle...Love it! It is a beautiful organic blend...don't know for sure what is in it as the bag does not say! The tea is so gorgeous itself! It looks very fresh and smells divine! Thank you so much for stopping by today. Martha and I really do get a thrill coming to visit all of you. We get to see your lovely posts, and beautiful tea cups! If you want to join in this week, just go and create a post with a tea cup in it that you would love to share, then come back here and link that post up to Linky Tools below. Love your robin's egg blue set. Beautiful! Tea would taste better in that! Thanks for hosting! Such beautiful teacups Terri! Thanks for hosting! Oh, this cup is so beautiful! I wish it was sitting in my cabinet!! Really really lovely!! 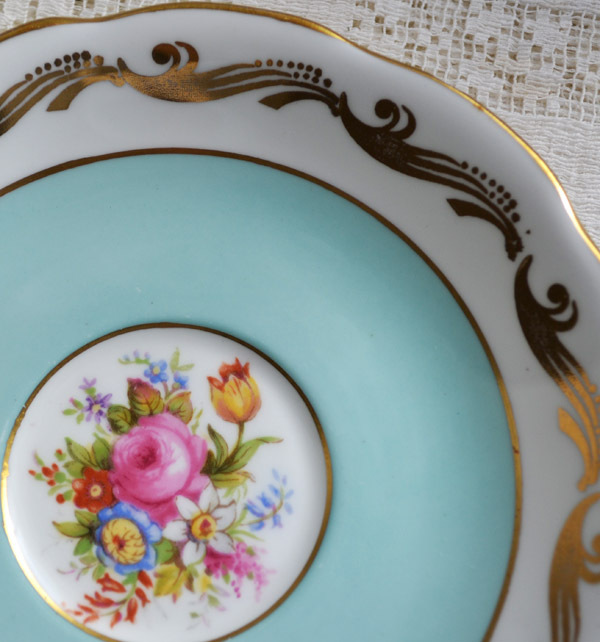 Your new teacup is stunning! 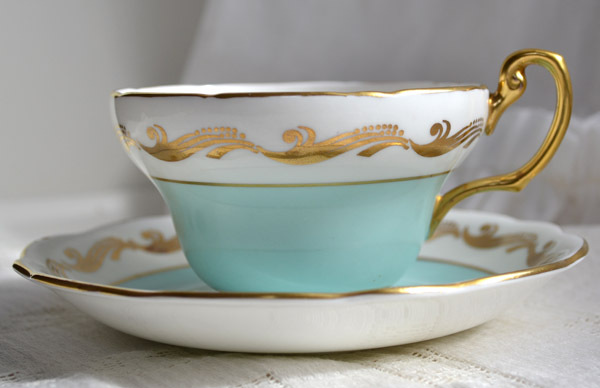 I adore a robin egg blue as it's a favourite colour of mine so your teacup is quite delightful to me. 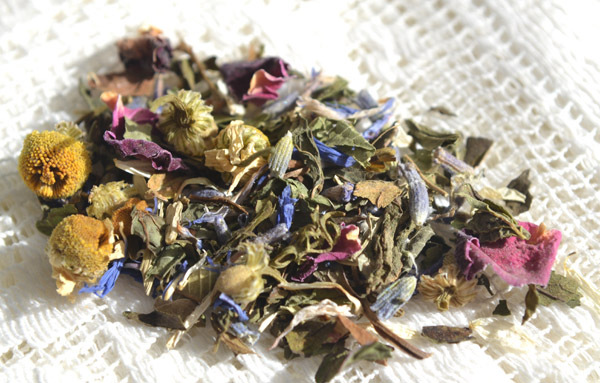 The tea resembles potpourri so I imagine it is quite a lovely tea. Thanks for sharing. Terri your tea cup is gorgeous!! I love the blue and lovely flowers. So beautiful. 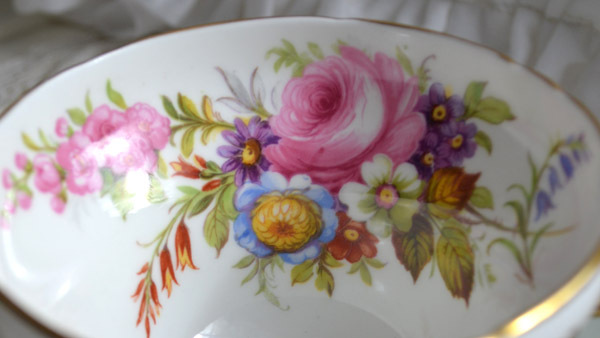 Terri, your teacup is gorgeous! I love the robin's egg blue color...so lovely! Thank you, and Martha, for hosting. Your cup is lovely. I have yet to find a Foley tea cup. You said it is of a good size, but that delicate handle does not look sturdy enough to use. The flowers are too good to be true. Your tea is lovely too. I too love the robin's egg blue set!! Stunning!! I love the blue color and all the pretty flowers inside! The gold makes it look regal...very beautiful! The tea is lovely also. 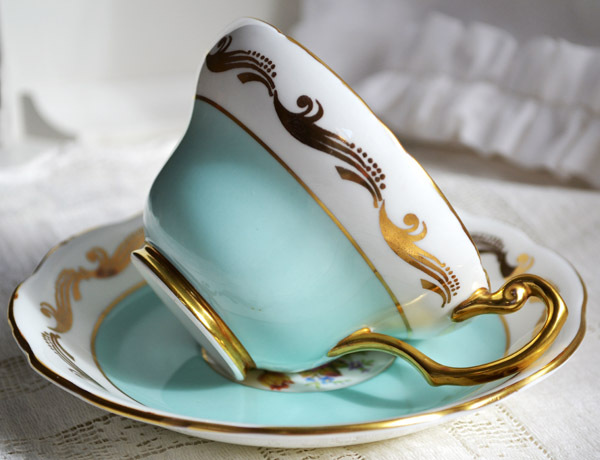 Just love this tea cup and saucer. The blue is so pretty and subtle and the flowers are well painted. Love it! 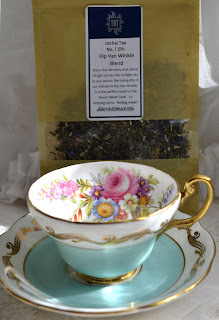 Hope the Rip Van Winkle tea doesn't make you sleep for a hundred years! Thanks for hosting. this blue like a robinegg is so pretty. The cup is really to swoon. Shape, color and decoration are marvellous. A real Martha Stewart cup and Jane Austen would have loved it, too. Terri, I want to thank you again for your generous giveaway and that you included me, far away from you, for the chance to win it. I made a blogpost with that cup, so you can see it in its new home. I will always treasure it and think of you when I use it. such a beauty! so chic! I really love your teacup and had to laugh at your very appropriate description of the colors as "Martha Stewart blues and greens",colors I love ! I appreciate the way you describe each teacup and learn a great deal from what you share. My newer teacups, although very pleasing to me, don't come anywhere near the beauty I see in most of yours. Thank-you for hosting this time. Your new Foley cup is lovely. Love the handle! 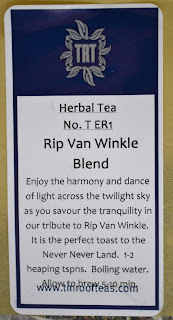 Rip Van Winkle tea ... I'll have to look for it. I'm intrigued! Happy Tea Day! Hi, Terri. Delicious looking tea! 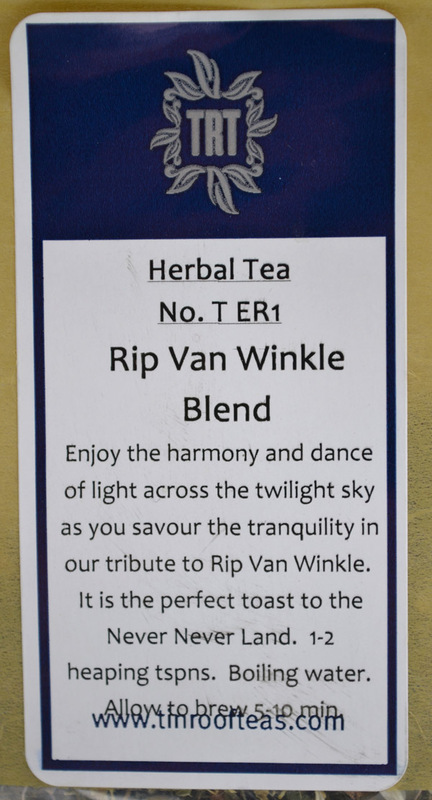 With the name Rip Van Winkle, I can only guess this tea is for bed time and it looks delightful! I would like to find some of that. Your tea cup to day is an awesome favorite!! I love the soft blue and the delicate roses inside. And who wouldn't LOVE all beautiful markings inside and out. I think I would feel like a queen if I had tea in that one!! Thanks for hosting today's tea. 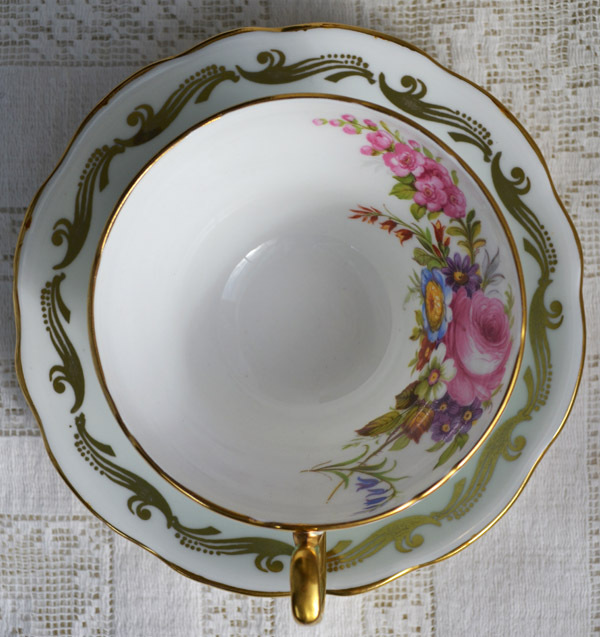 You always have such dainty and gorgeous teacups!!! Terri the colors of that cup and saucer are just too divine! It looks so beautiful from every angle, what a treasured find! i AM MORE A COFFEE DRINKER THAN TEA, BUT i AM LEARNING. yOUR CUP AND TEA ITSELF ARE SO BEAUTIFUL tERRI! Beautiful tea cup, Terri. Oh, that tea is beautiful, too. I'm guessing roses and lavender? Mmmm, I'll bet it smells as wonderful as it tastes. I have to confess that I look forward every week to your tea postings. I always learn something. I don't know how you manage to find such beautiful tea cups! I love everything in this cup but specially that amazing blue colour and the lovely bouquets (seem hand-painted to me). Congratulations for the purchase and thanks for sharing. Wow..another stunner! I do love a blue cup..this si exquisitely charming Terri! love love! and the tea is perfect..I'll take a cup please! Terri - I saw the stunner of a cup Johanna won over at her teatime and you were so sweet in packaging it with such thought and care! Always the creative touch! And, today's cup is lovely. I have my eye on a similar one that has a very '50's look to it - at the tea shop near me. Perhaps on my February excursion I shall make it mine - if it is still there. January's playtime cash is gone . . .
And, about that tea blend!!! Love the look - I'd display the leaves! I meant to join in for todays tea cup fun, but Im not feeling too well. Okay, I'm number 30 on your tea linky list! It's my Royal Albert cup in my Etsy Shop. What a gem of a cup. The colors are so beautiful. I love that blue and the touches of rose (and roses) oh, my! Oh, Terri, what a fabulous tea cup! The robin's egg blue, plus the flowers, WOW! Your tea looks pretty also. thank you for the sweet comments on my blog. welcome. i added my pretend tea cup to your party. i love your fairy school idea. I am 29 on your link list...sorry....i wrote the wrong number in my first comment earlier. I didn't have time to put together a tea post for my blog today, so I just linked to my Etsy where the cup I was planning to post about is listed. Maybe next week I will get it right! 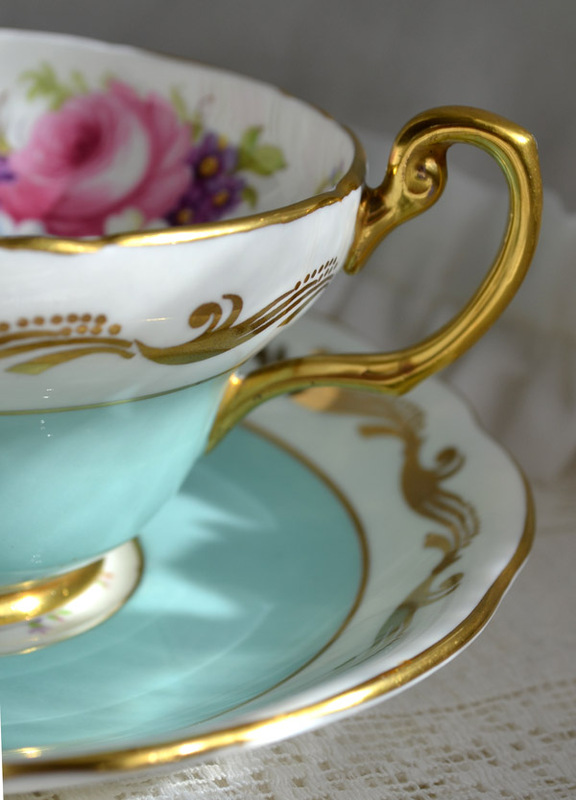 This tea cup looks enchanting. It's such a beautiful blue. Really lovely! Oh Terri, your cup is gorgeous! I love that perfect blue, and the beautiful, cheerful flowers are just what's needed on a cold winter day. That tea cup is a stunner AND your lovely van Winkle tea is a perfect compliment visually as well! I never get enough of that shade of blue! What a unique tea cup and sucer! I've never seen one where the biggest design is on the inside, with just a little gold and blue on the outside! I have been really enjoying reading your posts and pictures! 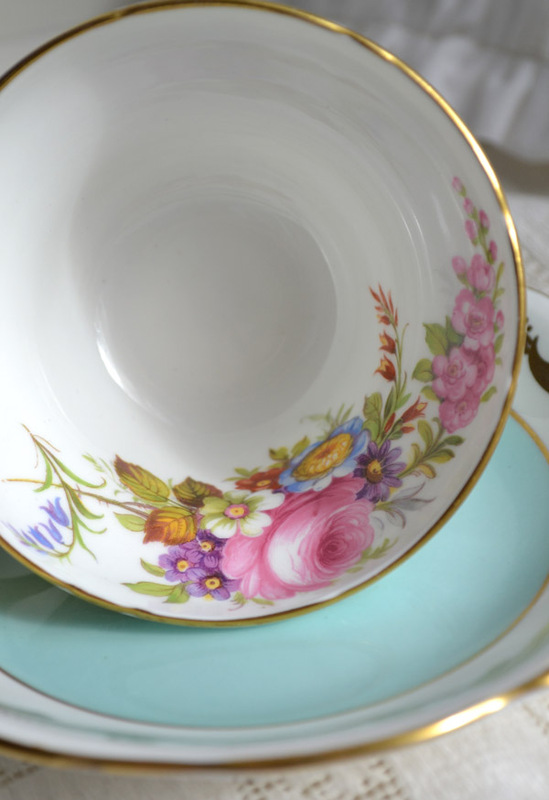 I love linking up on your "Tea Cup Tuesday" and checking out all the link-ups, too! 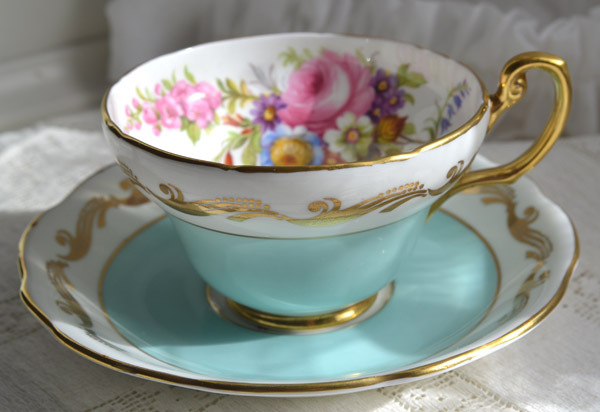 Your tea cup is beautiful Terri. Of course the blue is my favorite color right now. I loved the beautiful artwork you showed in your last post. I laughed about the being afraid to show the before pictures of your studio! Delighted to see your beautiful cup. I love the robin egg blue and then I saw it tipped with the inside flowers. Made me smile. I'll have to keep my eye out for the tea. Looks interesting.